As Latin American peoples, we usually recognize we have three cultural roots: the native indigenous societies, the Iberian invaders, and the slaves expatriated from sub-Saharan Africa. There is a fourth root of which we tend to ignorant, but which is revealed by our language as well as our material culture. Castilian inherited several non-European words to designate weavings and garments, which we continue to wear, five hundred and twenty years after Isabella and Ferdinand conquered Granada. We refer to terms such as gabán (overcoat), from the Arabic qabā'; chaleco (vest), from the Turkish yalak, and tafetán (taffeta), from the Persian tāftè. Belonging to three different families, these three languages bear characteristic phonological traits that allow us to trace the provenience of lexical items origin borrowed into the old Spanish. The majority of them come from Arabic, which is part of the Afro-Asiatic language family, but we also encounter etymologies involving the Altaic family, to which Turkish belongs, as well as the Iranian branch of the Indo-European family, which includes Persian. 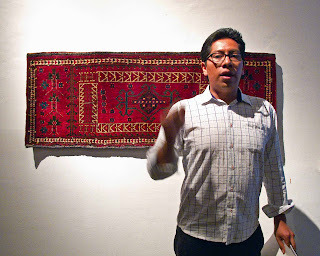 MTO's education director, Eric Chávez. If we examine in detail the Castilian textile terminology which has Arabic background, we found a curious pattern: many of the words refer to tunics and capes to shield oneself from the sun, protective gear for beasts of burden, and bedding for travel. Let us look at some examples: jubón (tunic), a garment worn by men in Mexico comes from ŷubba; enjaezar (harness), which means ‘to decorate a horse’, derives from ŷahāz; albarda (saddle), the straw filled cushion that protects the backbone of an animal against the friction of the saddle, has varied but little from the original al-barḍa'a, and almadraque (bed), an old fashioned name for a thin mattress, comes from al-Muttrah. This vocabulary inherited by Spanish originated in the nomadic habits of pastoral societies of western Asia and northern Africa. Once grains and herds were domesticated twelve thousand years ago, the Mediterranean Levant saw the emergence of a symbiosis between farmers and shepherds, where each sector developed its own technology according to its mode of subsistence. Alluvial soils along the rivers were worked by sedentary farmers, whereas the vast arid landscapes of the mid-latitudes became the habitat of wandering herders. 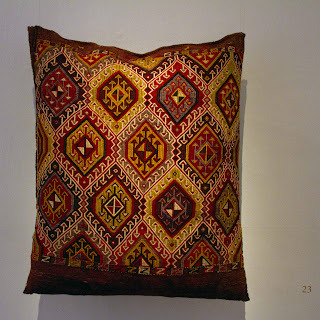 The ecology of the region conditioned the mode of production and shaped their textile technology. 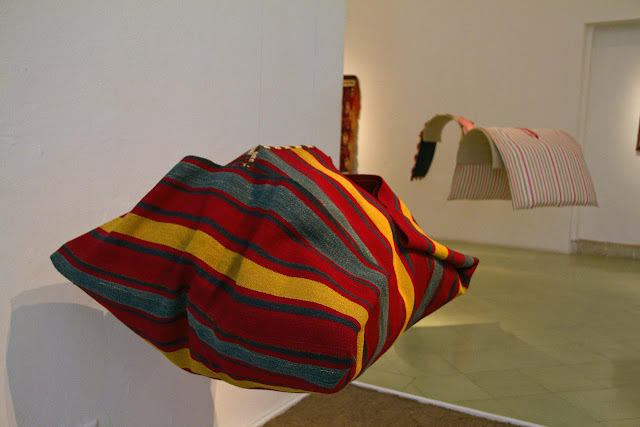 Saddlebags (alforjas in Spanish, from the arabic al-jurŷa), double bags which allow the load to be balanced on the back of a animal, are a textile prototype designed for nomadic life. Ingeniously constructed ​​from a single web, they serve to transport the rider’s basic equipment easily and efficiently. 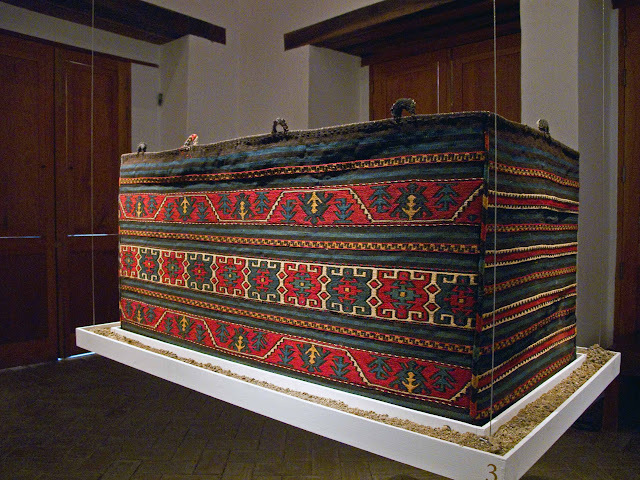 Likewise, rugs (alfombras in Spanish, from al-jumra, 'palm mat') and pillows (Spanish almohadas, from al-mujadda 'point where the cheek is supported’) allow a person to sit or lie down comfortably on the floor of a portable dwelling, in the absence of chairs and beds, too bulky and heavy to travel with. An almofrej or al-mufriš, a storage case. Recreated in Spain during the Moorish occupation of the Middle Ages, saddlebags and pillows came to the Americas with the conquistadors and their animals, to evoke the peoples of the desert to this day. In this exhibition we show some Mexican and Peruvian examples of both kinds of textiles, together with their woolen equivalents from Central Asia and the Middle East. Today, Oaxacan and Guatemalan saddlebags are woven coarsely of agave, but some antique pieces of cotton (from al-qutn, another Arabic word), have been preserved, soft to the touch and carefully embellished, which echo their old world antecedents. We also display various versions of the talega (ta'liqa, 'bag to hang') and the almofrej (al-mufriš, 'storage case for the road bed'), vital luggage for herders in their endless journeys. 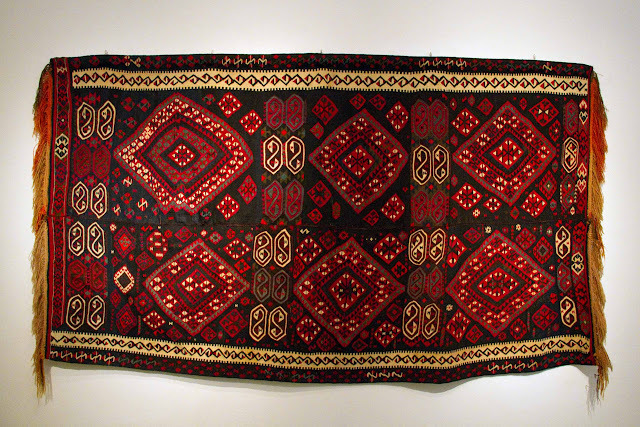 Some examples, woven by women Baluchi, Shahsevan, Yünçü, and other nomadic groups of Persia and Anatolia show striking parallels in technique and structure with indigenous Mesoamerican pieces. The itinerant way of life described in several biblical passages, shared ancestrally by Arabs and Jews, favored the emergence of a rich and varied textile artistry, which would resonate across the Atlantic. In weaving links between two hemispheres, we dedicate this exhibit to Alfredo Harp Helú, founder and patron of this museum, the grandson of Lebanese immigrants who arrived in Oaxaca early in the last century and became fabric and clothing manufacturers.